Dubai: While most experts are closely examining form books to narrow down their predictions for next Saturday’s $12 million Dubai World Cup, one of horse racing’s most powerful and influential men has made his own calculations. “This year’s Dubai World Cup looks the most open race,” said Shaikh Hamdan Bin Rashid Al Maktoum, Deputy Ruler of Dubai and Minister of Finance. Shaikh Hamdan recalled how the great American champion Cigar came into the inaugural race in 1996 as the big favourite and dug deep into his reserves to narrowly peg back Soul Of The Matter in what was a heart-stopping finish to the 2,000-metre dirt contest at Nad Al Sheba Racecourse. “Cigar was expected to win and he did,” said Shaikh Hamdan. Shaikh Hamdan was speaking to the media after inaugurating the 16th Dubai International Arabian Horse Championship, the world’s richest and most prestigious horse show in the world, at the Dubai International Convention and Exhibition Centre. The three-day event has attracted 221 high-quality show horses from over 20 countries around the world, including the American two-year-old champion, Exxaltress, which is owned by the Jeff Bezos family. Christina Bezos is representing the smashing grey’s connections in Dubai. 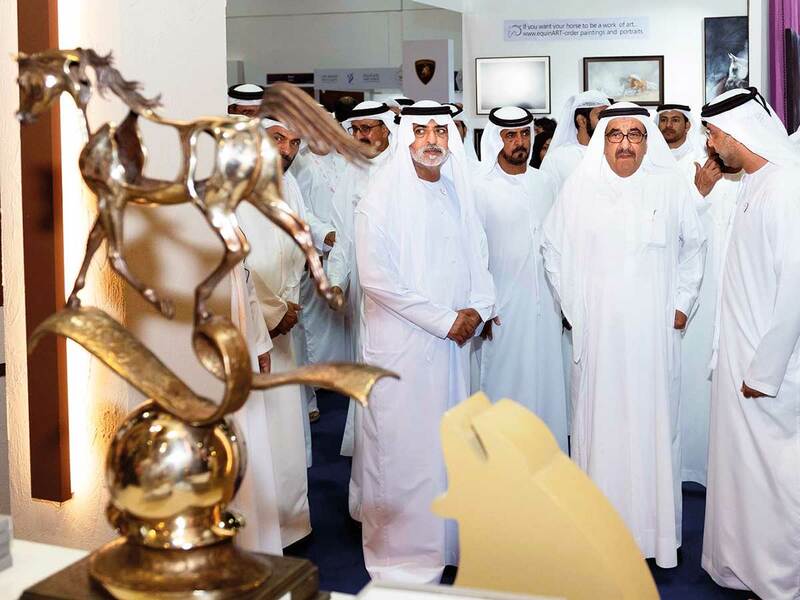 Shaikh Hamdan toured the horse show venue and the Dubai Horse Fair is held alongside at the Convention Centre and urged the organisers to keep raising the bar. “I’m happy with the number of countries participating here, but I urge the organising team to strive harder to make the show bigger and better in the future editions,” said Shaikh Hamdan. Meanwhile, the first horse from China made its debut in the horse show which featured six classes for males and females — seniors, juniors and yearlings. The horse show, which is held under the patronage of Shaikh Hamdan, culminates in the six gold championships on Saturday.